It is finally Peony season in New England. I say 'finally' because I've been seeing the blooms on blogs from back home for what seems like months. I have had complete peony envy. Not only because the season is later here than it is in the Midwest, but because I have no bushes of my own. Ugh. I used to at our old house in Fairway. It was not a mature set of bushes, but it was on its way, producing a handful of beauties every year. Enough to keep a couple of flowers on my coffee table, bedside table, bathroom vanity and kitchen counter for a couple of weeks. All a girl needs. What's worse? Now that our time has come in the North East I have to walk by bushes with their blooms blowing in the wind every day. You might think that someone who doesn't have peony bushes of her own might enjoy walking by bushes that are in bloom. No. Here's why : Peonies are a cutting flower, people. These ladies are meant for the stage. If you are lucky enough to have a bush with big, lovely blooms- cut them! Cut them in masses and bring them inside to enjoy. I'll repeat: They are a cutting flower meaning they are grown for cutting. They look best in when cut, not on the bush. Another cutting flower? Roses. Roses on a rose bush are not nearly as attractive as when it is cut and placed in a container- alone as a single bud or in a group. I used to feel guilty cutting flowers and bringing them inside until I came to this realization. Like all of us, peonies have their strengths and weaknesses. These girls truly are at their best when they cut and brought inside... in fact they last longer when they are kept out of the bright sun and heat. Do them (and me!) a favor and go outside with your shears and go crazy. Cut them! Put them around your house in every container you can find. Group them in pitchers and bowls- even vases if you've got 'em Give them to your friends and neighbors that are not as blessed with your bounty. Me? I have to buy mine- $5 each at the market. 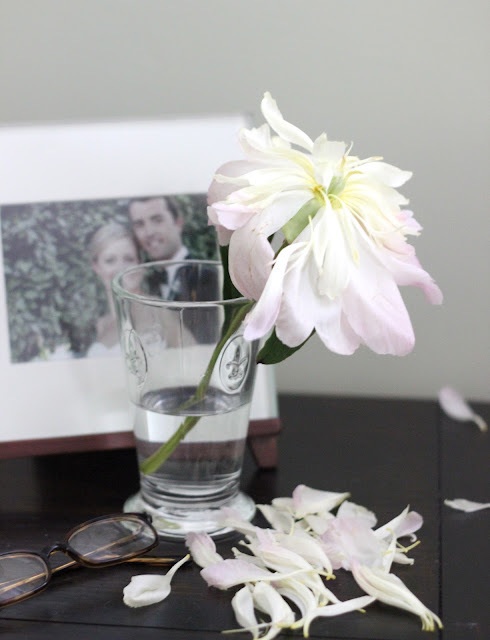 So, instead of big masses on my center island, I've plunked single blooms in drinking glasses, bud vases and bowls. I have to say, I really enjoy them as individuals. It helps me to appreciate these gals and their utter and completely flamboyant beauty. Still stunning even as she falls apart... if we all were so lucky. i always feel so bad cutting our roses, but i need to just get over it and enjoy their beauty inside! I love the simplicity of single flowers being displayed. Love the touch of color with the bright pink. Sadly our garden peonies are done for the year. Peonies are my favorite flower of all time. I've got some peonies in my garden but now that I've picked them all and put them in my house ...... the garden isn't as pretty but the inside of my house is. Yes, I do wish we all looked half as nice as those peonies still do while loosing their petals. Beautiful Jenny, my favourite flower and one of my favourite subjects to paint. I paint large canvases of flowers and Peonies feature in most of them. Sadly they don't grow in the area I live in New Zealand but we can buy them in florist shops in Auckland in November. I have to hang out until then to be able to buy some to photograph for new works. 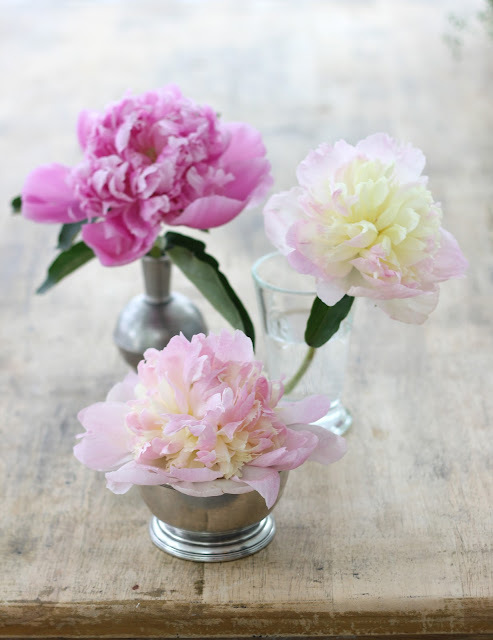 Peonies are one of my favorite flowers of all times......so beautiful, love how you are displaying them! 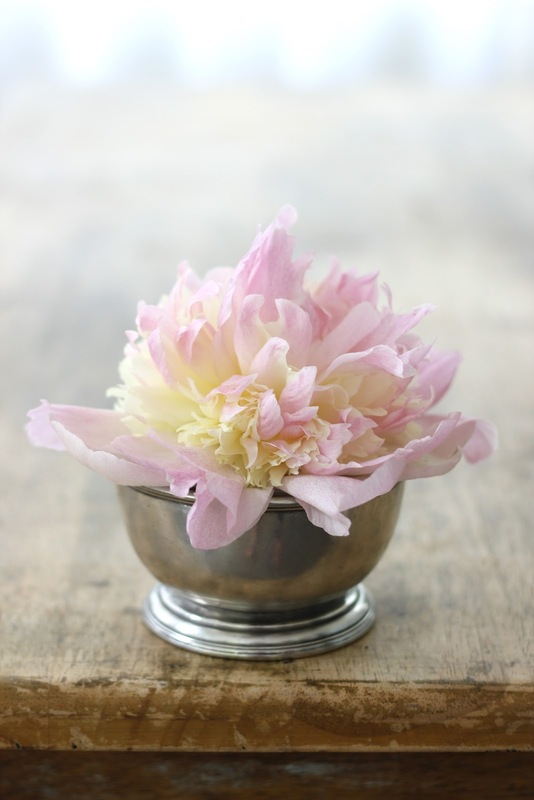 So true that peonies can stand alone...they're that lush and striking! How lovely to have them placed around your house as you showed!